Do you use the same Wirecast session/file for recurring shows? So we do a live show once or twice a week. I have it saved and it pops up every time I open Wirecast. I make a few modifications and then start the new show. One of the issues with this is I use Titler Live to display Facebook comments and each time I do a new show it opens a new tab in Titler Live that cannot be deleted. If you start a brand new show all those tabs won't show up, but I like to keep what I have created so I don't have to do it each week. For those of you who do a recurring show, do you just open the same file and keep using it over and over or do you start with a fresh one? If you do a fresh one is there anything you can do to import some of the existing shots? Oh, and while I am here is there a way to move shots left or right on your layers? Please make sure Wirecast and Titler Live are up to date. You don't list versions so I can't analyze that. It seems your issue is Tlter Live related though. Just grab the bottom title bar and move it. CraigS Thanks Craig. Wirecast is 11.1.2 and Titler Live is version 4.0 but I am updating it now. Ryan Abraham Occasionally NewBlueFX has updates to Titler Live that include bug fixes. Please post specific version number after updating and testing if you're still having the issue. Do test in a new document. CraigS So I have the latest Titler Live and I still cannot delete those tabs, but last I checked from their support you can't delete the tabs. Every time you use the same project in Wirecast and connect to a new Facebook live feed it creates a new tab. So I guess the question is, if you do a recurring show do you create a brand new project each time? I just reuse the same one, but then I get all those tabs. Is there a way to copy shots from previous projects? if you do a recurring show do you create a brand new project each time? I just reuse the same one, but then I get all those tabs. Is there a way to copy shots from previous projects? Firstly, I would discourage you from using Titler Live on the same system as your wirecast install. The idea of integration with Wirecast is a good idea, but there are so many reasons to avoid this. The CPU load from Titler Live even with no titles running is way above what I would expect. Anything vaguely complex will kill you totally. I've reached out to Titler Live on their support forum a couple of months ago, but I am still waiting for an answer. So. If you're doing it on another computer, how does it work? Titler outputs can send to NDI, which in turn appear in Wirecast as inputs. You will have only ONE tab in Titler Live, which I send as an input to a shot in the top layer in Wirecast. This removes the ability to fire different individual titles within wirecast by activating shots, but the CPU load and performance is just so much better overall. Ryan Abraham Greg makes very good recommendations. Greg Kuhnert There are people from Titler live who do visit this forum from time to time. It does seem as if Ryan was able to reach them. Greg Kuhnert Thanks Greg for the recommendation. Titler Live can be very laggy when running at the same time on the same machine and I have a beefy computer designed for gamers. One of the options on Titler Live is the ability to use it over the web on another computer. Do you not recommend that option? For your suggestion is there some sort of step by step instructions on how to get that to work? Not sure exactly how to connect the Titler Live on my second computer to the Wirecast on my main computer. Will it show up under the Network shots through NDI? My assumption is if we make that shot active in Wirecast it will show whatever Facebook comment we selected on the second computer running Titler Live, right? I am also thinking of upgrading to Titler Live Social so we can do other live comments/questions besides Facebook. We broadcast to Facebook, Periscope and YouTube and get questions from all of them. CraigS Thanks Craig. Yes, I have emailed with the Titler Live support folks and they were very helpful. So my using the same project over and over is OK on Wirecast? If I can get rid of the tabs problem by running Titler Live on another computer that should make things run smoother. Thanks! So my using the same project over and over is OK on Wirecast? In and of itself, yes. Greg points to the advantages of having Titler Live running on another computer which can help. One thing I am still unsure of, running Titler Live on another machine. What is the process to do this? Do I have to install Titler Live on the other machine? How do I connect it to the main computer running Wirecast? Ryan Abraham - Yes, install it on the other machine. You can use NDI output from Titler Live, which will appear as a network input in Wirecast. BUT: Note: You will have ONE tab in titler live, not many tabs. You can then fire those from titler. I'd suggest experimenting and see if that model works for you. Greg Kuhnert thank you! I will try it out. Greg Kuhnert Hey Greg, I have Titler Live running on a second computer on my Network, I have the title I want running and I turned on the Video Out for NDI. In Wirecast on my main computer I could see the NDI source called ASUS (01) which is my laptop and the 01 tab as I only have that one tab. There is a reconnect button but that doesn't do anything. For some reason it sees that Titler Live NDI and it just shows a blank screen. I tried to do NDI with Skype as well and I got the same blank screen. Could something be blocked? Ryan Abraham I also downloaded the NDI Studio Monitor and I can see the ASUS 01 tab there and display it fine. I am using a trial version of Titler Live Social on my laptop because I am thinking about using that to run Twitter and YouTube questions as well. 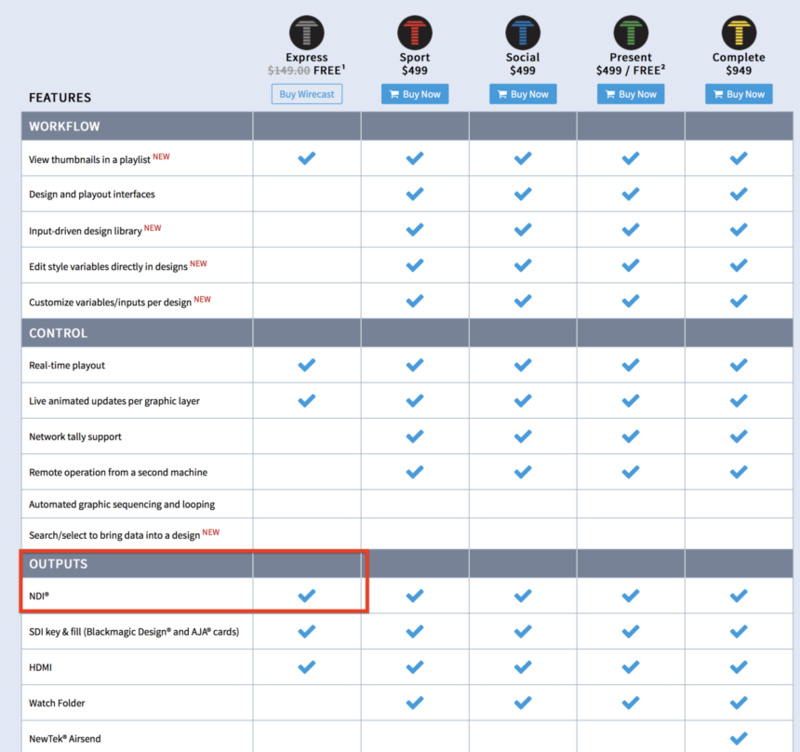 Ryan Abraham Although our feature comparison chart shows NDI Out available in Titler Live Express. I also downloaded the NDI Studio Monitor and I can see the ASUS 01 tab there and display it fine. If you see it in NDI Monitor you should see it in Wirecast. You may want to close NDI Monitor and restart Wirecast. CraigS it is on the Wirecast computer. I ran it before I even downloaded the NDI Monitor and like I said it just shows connecting but no image. Ryan Abraham Please close NDI Monitor and test again in Wirecast. We must confirm that NDI Monitor sees Video and Wirecast does not. I ran it before I even downloaded the NDI Monitor and like I said it just shows connecting but no image. Please follow my test instructions. Sometimes it takes time for the network to respond and if you test Wirecast then NDI in that order you may not get accurate results. You should test in Wirecast 12.0 just released. CraigS Hi Craig. I am on Wirecast 12.0 already. I also just rebooted the main computer with Wirecast, got my 2nd computer with Titler Live running and outputting to NDI. The main computer didn't recognize the NDI output at first, but it eventually did and it showed up under Network as an NDI Source called ASUS (01). When I select that source, it still shows up blank with a "Connecting..." is you can see in this screenshot. I have not run the NDI Monitor at all at this point. I then opened up the NDI Monitor on my main computer with Wirecast after closing out Wirecast and Titler Live (on secondary computer). I restarted Titler Live and could view the NDI output fine on my main computer with the monitor. Hope that helps. Not sure why it says "connecting..." I think the same thing happened when I tried to do NDI with Skype, it just came up blank like this. Ryan Abraham Thanks for that. Report the details as you just did. NDI Monitor on Wirecast computer sees Titler Live but Wirecast 12 does not. We'll send you a case number and test on our systems. If it works for us we'd get back to you and get some more information. CraigS OK I put the request in for support. Thanks! Ryan Abraham You're welcome of course. Explaining that you confirmed with your testing is important. We'll test on our end. We may get back to you with questions otherwise you can use your case number and ask if they've confirmed the issue on their end. CraigS FYI I did a workaround for now. 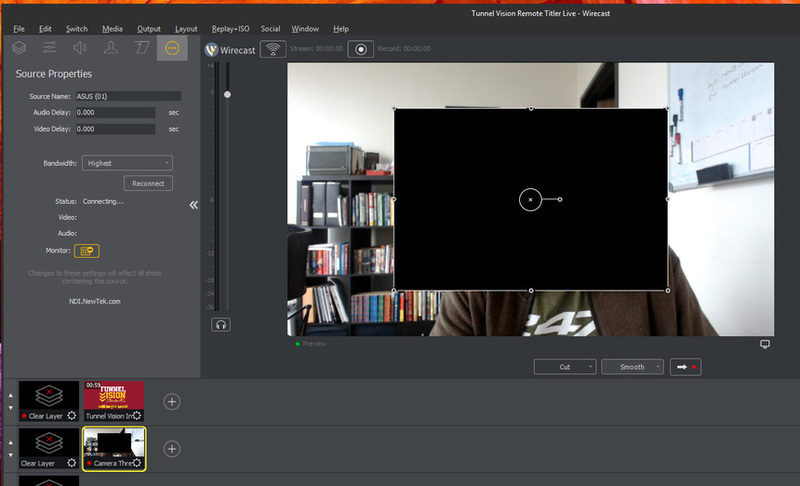 I ran Titler Live on a secondary computer, viewed it in an NDI Monitor on my main computer running Wirecast and then in Wirecast captured that window and brought it into my broadcast. So I was able to run Titler Live on a different computer. The biggest issue was in the NDI Monitor if no title was being shown, you got a black screen so I had to turn it off in Wirecast. Would rather have no title = transparent.